There are lots of excellent standalone security cameras available, but if you want to protect multiple areas of your home or small business, it might be time to consider a multichannel camera system. These systems allow you to view the feed from multiple cameras at once. That way you can keep an eye on your kids playing in the backyard, watch out for package theft near your front porch, and still have cameras left to protect the garage, basement storage room, or any other area that needs some extra security. Most of Night Owl’s systems are either NVR or DVR. NVR systems use IP cameras that can be connected wirelessly. DVR systems use cameras that have to be directly connected to the DVR with a coaxial cable. There are benefits and drawbacks to each type of system. If you already know which type of system you want, check out our NVR recommendations here or DVR recommendations below. If you need help choosing between an NVR or DVR system, you can read more here. These two systems are essentially the same. The key difference is that one supports four cameras while the other supports eight. Aside from that, they come with the same cameras and security features. The NVR also has a preinstalled 1TB hard drive, so you’ll have tons of room to store video files. The Night Owl security cameras themselves have a wide field of view, special motion sensors that use motion and heat to limit false alarms, and two-way audio so you can communicate even when you’re not at home. Night vision range: 100 ft. These two systems include the same cameras and security features. The only real difference is that the eight-channel system comes with more built-in storage (and of course, the ability to support more cameras). This system is hardwired, so it is more work to install. However, since the cameras connect directly to the DVR, you don’t have to worry about the signal going out if there’s a spotty Wi-Fi connection. The DVRs also have plenty of built-in storage—the four-channel DVR has 1TB and the eight-channel DVR has 2TB. One of the highlights of this system is that it comes with extremely high-res cameras. While standard high-res cameras are often about 2MP, these 5MP cameras capture clear images with lots of details. Plus, like the cameras that come with the NVR, these cameras include motion sensors and two-way audio. What if eight cameras isn’t enough? 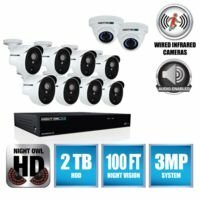 Night Owl also offers 16-channel DVR systems. In most cases, we suggest sticking to the four- or eight-channel systems because they come with better cameras. You get a wider field of view, two-way audio, and higher resolution. However, if you need to cover a larger area, this system still comes with high-quality cameras—they’re just not quite as capable as the cameras that are included with the systems highlighted above. This system can support 16 cameras, but it only includes 10. Eight of those cameras are bullet cameras and two are dome cameras. You can add more bullet or dome cameras in the future if your needs change. Just note that while the dome cameras include two-way audio, the bullet cameras do not. NVR vs. DVR: Which system is right for you? In most cases, we’d recommend choosing an NVR system, but your personal needs may vary. Why choose an NVR system? The biggest benefit of an NVR system is that it’s wireless. This means the system is much easier to install, but it also means you have more placement options when you’re deciding where to put cameras. Plus, since NVRs are more modern and more popular, you may have access to newer, nicer cameras if you choose an NVR system over a DVR. NVR systems usually cost more than DVR systems, but you’re paying for more convenience and flexibility. Why choose a DVR system? 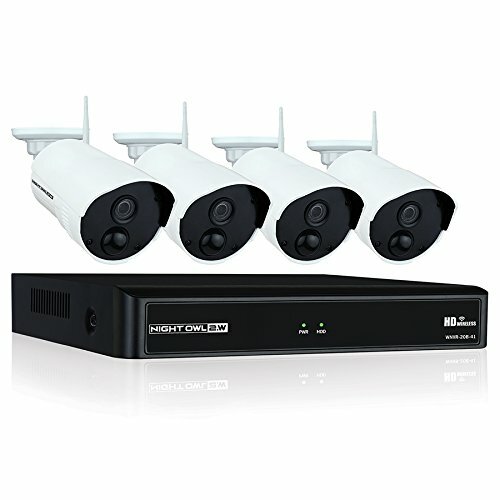 The main reason to choose a DVR system is that they usually cost less than NVR systems. DVR systems are becoming less popular because they’re harder to set up. Plus, since cameras have to be connected to the DVR with cables, you don’t have as many options when deciding where to put your equipment. While less flexibility is a downside, using cables often means you have a more reliable signal between the camera and the DVR. Should you choose a Night Owl camera system? There’s a lot to like about Night Owl, but it isn’t the perfect solution for everyone. Here’s what you should know if you choose a Night Owl system. The biggest drawback to choosing a Night Owl system is that it won’t come with professional monitoring. That means that if someone sets of a motion sensor in your camera, you’ll have to contact authorities on your own. If you invest in a monitored security system, someone will contact authorities when an alarm goes off, even if you aren’t available to make the call yourself. If you’re looking for a system with professional monitoring, check out our post about the best home security systems. If you don’t need professional monitoring, Night Owl may be a great option—you get high-res cameras, tons of local storage, remote access to your system, and 24/7 customer support. Plus, you won’t have to pay any monthly monitoring or storage fees. To learn more about other security cameras on the market, check out our other recommendations. Do you have security cameras installed in your home? We’d love to hear about your experiences. Share your insight in the comments below.